Railpictures.ca - A.W.Mooney Photo: Those little GMD SW9 switchers were not exactly common on CP. They only had 6 on the roster. And here are three of them, at rest between switching Agincourt Yard. CP 7403, 7402 and 7405. These units, part of an order 7400-7405 were built in 1953 and eventually renumbered in 1982/83 to 1200-1205 before being rebuilt/sold/retired. | Railpictures.ca – Canadian Railway Photography – photographie ferroviaire Canadienne. Caption: Those little GMD SW9 switchers were not exactly common on CP. They only had 6 on the roster. And here are three of them, at rest between switching Agincourt Yard. 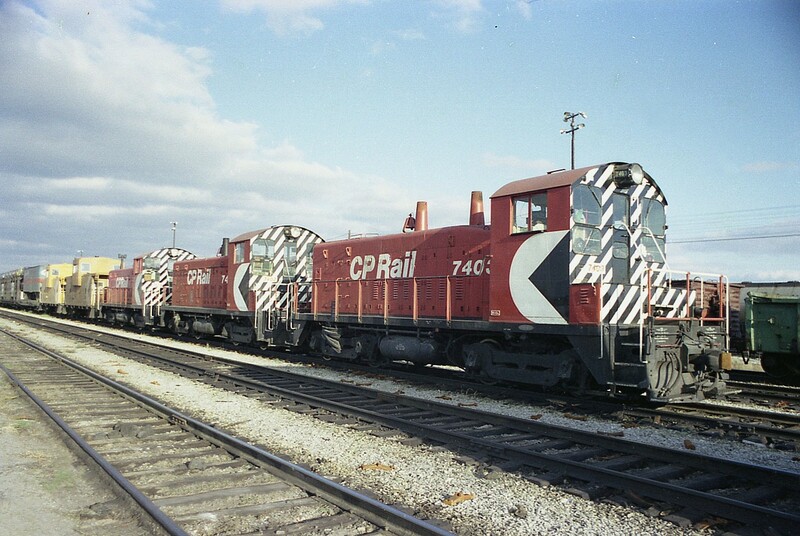 CP 7403, 7402 and 7405. These units, part of an order 7400-7405 were built in 1953 and eventually renumbered in 1982/83 to 1200-1205 before being rebuilt/sold/retired. Yup, as a kid I’d ride my bike to the old Agincourt station off Brimley Rd. and watch these guys push cars over the hump. If only I had a camera then…..